Very well built No turntable - but cooks evenly. The Samsung CM1069 is designed primarily for the commercial environment, with a large 26 litre capacity and 1100w of power. Instead of a traditional rotating turntable, it features a ceramic static base, and stainless steel cavity for easy cleaning. The stainless steel interior is 22.5cm by 33.6cm by 34.9cm. 4 power levels are included, together with 20 presets. The door, base and control panel are all stainless steel for durability and ease of maintenance. The handle feels pretty substantial too, and provides easy access to the interior. The buttons are very large and well labelled - so ideal for use within the catering and commercial environment. Build quality is very good - the silver microwave weighs a hefty 17.5kg and measures 51.7cm by 41.2cm by 29.7cm externally. Essentially this is a large commercial microwave, which is easy and quick to use, with a decent construction, which should result in reliability. 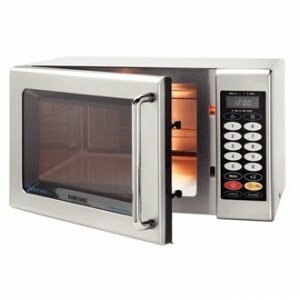 The Samsung CM1069 is a solid commercial microwave, which is well built and easy to operate. The build quality suggests it should offer years of reliable service.